And why our cat water fountains and indoor fountains cost what they do. Because so many of the products we encounter today are mass produced, and inexpensive, many of us have become blind and insensitive to those which are not. How often do you encounter a handmade product? Particularly a handmade functional product? How many handmade functional products do you own? Do you own a cat water fountain? If you own a commercially made cat water fountain then you own something that was made on an assembly line by the thousands, probably in China – each is identical to the other with absolutely nothing to distinguish it from any of the tens or hundreds of thousands of its kind. And that’s fine, if that is what you want. You probably paid a fair price for your cat water fountain – enough for the company to make a healthy profit in the sale of tens of thousands of them – but not too much to make it out of reach of your economy. As said, so long as they are not made of plastic, (which is harmful to cats) those cat water fountains are fine. If that is what you want. But they can’t be compared to a handmade cat water fountain. They are not even in the same league. Here is why. 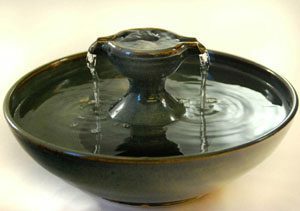 We buy all our cat fountain ceramics supplies from Northeast Ceramic Supply, located in Troy, NY, about an hour south of us. 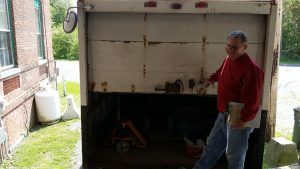 Dennis delivers the materials – the clay, raw glaze materials, tools, etc. to our loading dock. We all go down, load up the hand trucks and transport it via elevator to our shop on the second floor. That’s step three. Step one and two are determining our needs and placing the order. After everything is properly stowed, we can begin using it. To create a cat water fountain we need to make a bowl and a center piece. Both are thrown on the wheel, while the center piece usually undergoes from minor to major hand work afterward. More on that later. 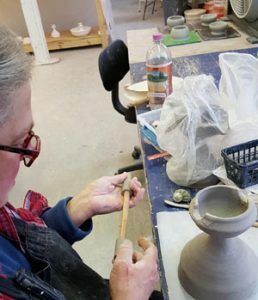 Before throwing, the clay needs to be worked in order to remove any air bubbles and to soften the clay and make it malleable. That is called ‘wedging’ the clay. Once wedged and the wheel is set up with the necessary tools and a bowl of water the throwing begins. Most people have seen at least images of this so no need for too much detail here. 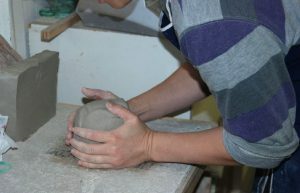 The ball of clay, previously weighed out for the size bowl wanted, is thrown onto the bat and centered. This is how you get a perfectly round cat water fountain. (They can still warp at any time in the drying and firing processes – some always do. Those are marked down and sold as Reduced with the flaw stated). Everyone who tries their hand at throwing on the wheel is amazed at how easy it is not. 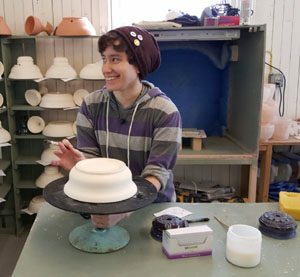 Many give up after the first episode of trying to learn how to center a ball of clay, let alone form it into a pleasingly shaped vessel. 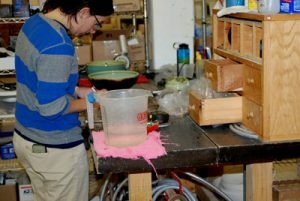 Thirstycats employs deeply skilled and experienced potters. 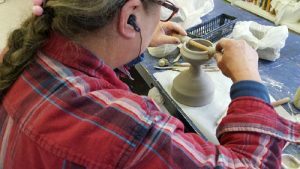 We don’t call ourselves ‘masters’ – we’re not even sure what that would be – but we’re very good potters and we can throw. Which is why we can make the beautiful cat water fountains we do. So the bowl and the base for the center piece are thrown on the wheel. The center piece for the cat fountain is placed on one set of covered shelves to be taken up later for hand working, while the bowl is set on another shelf to dry for the rest of that day. It is then transferred to another set of shelves which are wrapped in plastic sheets in order to ensure slow drying. The drying takes several days. In general the time between throwing the bowl and a bowl becoming a cat water fountain ready for purchase is about two weeks. A bowl in the process of being trimmed. The foot is not yet carved. When sufficiently dried but not too dry the cat fountain bowl is put on the trimming wheel. 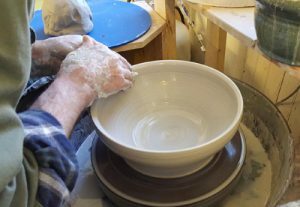 Because we are experienced potters we don’t need to trim anything off the bowl itself usually – it is already the thickness and form we want – but we do need to give it a ‘foot’. All our cat fountains and almost every piece of plate or bowl pottery you have seen has a foot. It is created by using special trimming tools to form the base on which the bowl will sit and to give the base definition (the foot). This is for both aesthetic as well as practical reasons. The foot gives the bowl a more refined look and it also helps keep the glaze from running off the pot onto the kiln shelf, which usually destroys the piece. When carving the foot we give it a bevel which, with the help of wax, (more on this further on), helps keep the glaze from sticking. We also sign and date the bowl. Once trimmed the bowl is placed on yet another set of shelves without any wrapping in order to dry further. It stays there for a minimum of two days. Is there a cat water fountain in this story? Yes, but it is a ways off yet. Please, read on. So far we’ve been following the cat fountain bowl. Let’s go back to the center piece. The base that was thrown for the center piece needs to be trimmed. This is done on the trimming wheel. If it is a dome center piece it needs at the minimum to have the hole drilled into the top. If it is going to be un-ornamented it then only needs to dry and be sanded. If it is going to be ornamented then it will either be carved or carved and, after bisque firing, painted with under-glazes. The painting may need to be waxed if there is not to be an over-glaze. These domes go into the creation of our ‘bubble-up’ cat water fountains. Alternatively, a sculpture of an animal or some other form may be added to it and that will be painted with under-glazes. If it is a tower type then any number of things may be done to it but since we are following the creation of a Piazza with two spouts, let’s look at that. The upper cup for the Piazza is also wheel thrown but it needs to be attached to the tower’s stem and the channels have to be created. Unlike wood or metal, clay moves as it dries so has to be adjusted frequently while drying. The two channels need to be even with one another and this means constant measuring and manipulating to make and keep them so. Too much manipulating after the piece is too dry creates cracks. The piece, once formed, is covered for slow drying, after which it is sanded and refined. Almost always we are doing either a bisque or glaze firing so the now pretty-dry ‘greenware’ bowl we trimmed and let sit is ready to go on top of a hot kiln for yet another degree of drying along with the Piazza center piece. 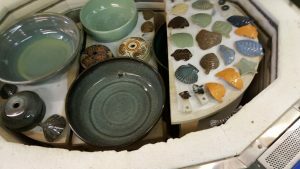 (If you put a piece that is not sufficiently dried into the bisque kiln it will blow up into about a thousand pieces and destroy everything near it.) It stays on top of the hot kiln for at least 12 hours. 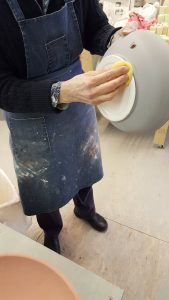 Wash the bisqued pieces with a damp sponge to remove any dust, which would ruin the glaze, and we record its dimensions, the date it was trimmed, the glaze we are using on it and whatever other specifics deemed important about it onto a file card. We then wax resist the foot. Wax resist is a specially formulated blend of wax and other materials which keep it liquid, with which we ‘paint’ the foot. Glaze is glass and when it melts it flows downward – some glazes are ‘runny’ glazes, others are more stable but they all move. The wax resists the glaze – not allowing much of it onto the foot. Next in the creation of our cat water fountain comes the applying of the glaze, but do realize that before we can do that we have to make the glaze. We don’t buy jars of ready made and mixed glazes, nor do we buy bags of powder glaze we just mix with water. If we did, we wouldn’t know exactly and how much of what it in them. Rather we make each glaze from scratch with raw minerals, weighed out element by element on a gram scale. 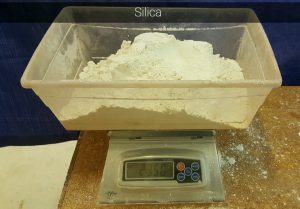 For our tried and true glazes we make 10,000 grams dry weight. For test glazes we make smaller batches. Most glazes have about seven different minerals that must be weighed out according to the percentage they are to be in the glaze, ie., 20% silica, 10% ball clay, 3% cobalt carbonate, etc. We dry mix all the minerals, add water, wet mix and screen through an 80 mesh, hand-crank screen. All glazes get this process. 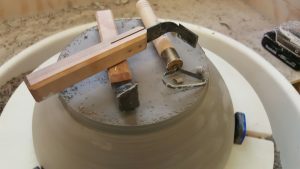 Spray glazing – We fill a paint gun container and spray the glaze onto the bowl and center piece, along with the cord cover and ceramic insert if there is one. This is done in our spray booth which we had built to our specifications. Works wonderfully. We usually use two glazes on each fountain which is how we have the glorious colors we have. Now we can apply our glaze to our cat water fountain bowl and center piece. The glazes are in liquid form in 5 gallon buckets but they need to be remixed before every use with a drill mixer. Cleaning the foot of each piece. After applying the glaze the foot of the piece needs to be cleaned. First the bevel of the foot is scraped with an exacto type knive. The foot is then wiped with a wet sponge and then a paper towel and the piece is set aside. You don’t just put any piece anywhere in the kiln. The kiln is finite in size and every cat water fountain bowl and center piece has a specific diameter and height, so every kiln loading has to be worked out for maximum efficiency. 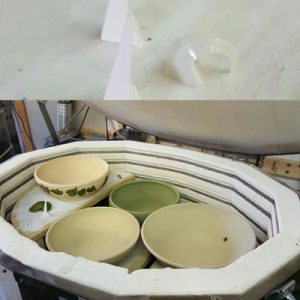 The pieces can’t be too near the walls of the kiln or they risk warping, nor can they be too close together or they risk sticking together (they can expand by as much as 30% in firing) and the shelves need to be high enough above them for the same reason but not too high and the kiln needs to have a balanced load for even distribution of heat. We put pyrometric cones on every level in the kiln for every firing in order to record how the kiln fired. This changes constantly with age and use and must be recorded constantly so we can make micro-adjustments to the firing schedule and ensure a high quality firing result. Bowls about to be glaze fired. Notice the pyrometric cone on the left shelf and at the top of the image. Ok, we’re getting close to having a cat drinking fountain. The kiln is loaded, the firing schedule is set, the kiln fires to 2,232℉, shuts off and when cooled enough (at least a full day later) we open and empty the kiln. As we do so we record all our settings, the degree of bend of our test pyrometric cones and the results on the ware, in our notebook. So, how do we go from a glaze fired ceramic cat fountain bowl and center piece to a cat fountain? So glad you asked. When we trimmed the fountain bowl we also drilled a hole of a specific size into the bottom side of it. This is where the ‘feedthrough’ goes, allowing the pump to be replaced when and if it goes so you don’t have to loose the entire cat fountain because the pump has gone. Replacement is easy. Our ‘feedthroughs’ are specially created for this use and unlike others who use silicone to bind them to the fountain bowl, we use another specially formulated, underwater epoxy used in the swimming pool and spa industry. 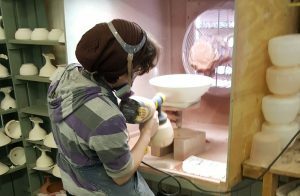 We cut every feedthrough to fit its particular fountain bowl (based on thickness of wall and curvature) with a mini-chop saw and epoxy it, permanently, into the bowl. They do not ever loosen or leak. The following day we can build the cat drinking fountain. We install an aquarium grade, filtered, adjustable, re-circulating pump, onto the cord of which we install a polarized plug. We record its new data on the other side of the same card we put the initial information on. (The fountains shrink a half inch in diameter in the glaze firing so its new size gets recorded) and any other particulars, including which pump, how many cups it holds, whether it has copper or not, etc. We fill and test the fountain. When satisfied with its performance (silent pump, good flow, no splash) we place the fountain in a photography tent, photograph it and upload the images to the computer. With the particular fountain in front of us at the computer we adjust the images in Photoshop for correctness if needed. We are not trying for beautiful pictures of our cat water fountains at this stage, we are trying for accurate ones and that is what we achieve. What you see in our shop is what you will get (apart from any monitor differences). The fountain is then listed on-site with all its pertinent data, price and shipping price data. The Finished 2 Spout Piazza Fountain. The fountain is then listed on-site with all its pertinent data, price and shipping price data. Now compare all that to a factory made cat fountain where each one is the same. What they do is make ten thousand all at once on an assembly line and market it once, all with the same image and information. What we do is make one, one at a time in a lengthy, extraordinarily carefully monitored process and market it one at a time, with new information and new photographs for each individual fountain because they are all individual and one of a kind. So now you know why our fountains cost what they do and why they cannot be compared to any other cat water fountain in the world. No one, not one other person on the planet goes through what we go through to make our Thirstycat cat water fountains. And we do so hope you enjoy them. Each of us works very hard to make the finest cat water fountain available and when you show your appreciation for this, as so many have, we are genuinely grateful. PLEASE READ WHAT OUR CUSTOMERS SAY.